Children of a Darker Dawn (formerly titled Railway Children) DVD and Digital Release scheduled for North America on December 17th. Teen Sci-Fi/Horror title from October Eleven Pictures will be distributed on DVD and all digital platforms in North America by MVD Visual Entertainment. Children of a Darker Dawn is the first of an edgy series of features exploring the darkest corners of the Emerald Isle. The Collection is being launched for sale on all platforms worldwide by Los Angeles-based Pop Twist Entertainment. Described by Zombiehamster.com as “A Stunning Mixture of Cormac McCarthy’s ”The Road” and ”Lord of the Flies”, Children of A Darker Dawn is a teen Sci-Fi/Horror thriller that envisions a post-apocalyptic world without adults. Named one of the Top 20 Darkest Arts of 2012 by US reviewer, The Conduit Speaks, it was nominated for Best Independent Feature Film and Best Director in the our very own BloodGuts Film Awards. The film is written, produced and directed by Irish Film and Television Award nominated director Jason Figgis . Among October Eleven Pictures’ earlier films, Figgis’s acclaimed occult documentary The Twilight Hour was sold for broadcast by Pop Twist Entertainment into 100 territories worldwide, and aired as part of an acclaimed art series on RTÉ Network 2 in Ireland. 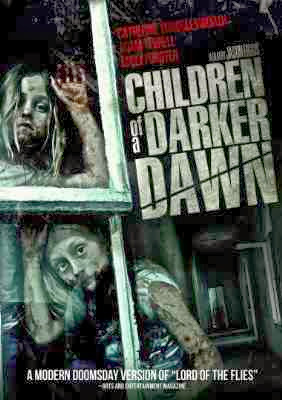 In Children of a Darker Dawn, a virus has decimated the adult population, driving parents insane and then into death. Small children and teens are left to watch the horror unfold, and then to fend for themselves. Sisters Evie (Catherine Wrigglesworth) and Fran (Emily Forster) travel from town to town, foraging for food and carrying memories of their mother (Jennifer Graham). Finding overnight shelter in a derelict building, they are awoken by shouts… and a battle between the newcomers and a teen commune with a dark past of its own begins. The tense atmosphere explodes into violence and bloodshed. Teen romances, sexual jealousies, and sadistic cliques inflame a grisly struggle for food. It’s the road to a grim new civilization.